This NIH funded research is a longitudinal developmental study of the early features of anxiety in very young boys with FXS contrasted to boys diagnosed with ASD (non-FXS) and typical controls. The aim is to determine which initial features of anxiety can be detected and the stability and prognostic value of these early symptoms to diagnostic categorization across two populations associated with ID and at high risk for anxiety. Extension of initial infant study to longitudinally track the onset of autism through preschool in fragile X syndrome, autism spectrum disorder and typical controls. The proposed project is a renewal application designed to extend the findings of R01 MH079252-03 that successfully tested and modeled the relation between potential protective factors and mental health outcomes for a sample of 302 youth in foster care over three time points. This NIH funded research is a longitudinal investigation of language development in adolescent and young adult males with fragile X syndrome. The aims are to characterized the course of development of language from adolescence and into young adulthood in fragile X syndrome and to identify the psychological, environmental, and biological factors that lead to more or less favorable trajectories of language in individuals with fragile X syndrome. The purpose of this NIH funded research study is to identify behavioral features and biomarkers that predict autism severity in infants with the FMR1 mutation (full mutation and premutation) and disassociate features from those with idiopathic autism. This NIH funded research study aims to clarify the nature, underlying mechanisms, and functional consequences of pragmatic (i.e., social language) impairments in the FMR1 premutation. This work will inform the range of features that may be attributable to FMR1-related genetic effects and has implications for potential prevention and treatment efforts. This grant supports an undergraduate research assistants, Ms. Hughes, to engage in mentored research examining gesture development in infants with fragile X syndrome. This grant supports an undergraduate research assistant, Ms. Porter, to engage in mentored research examining the impact of maternal anxiety on language outcomes in adolescents with fragile X syndrome. 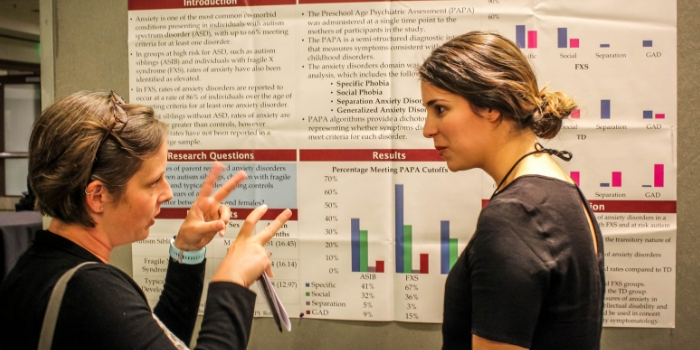 This grant supports an undergraduate research assistant, Ms. Cantu, to engage in mentored research examining nonverbal communication in women with the FMR1 premutation. This grant supported two undergraduate research assistants, Ms. Herron and Ms. Mazur, to engage in mentored research examining the relationship between language development and disorganized attention in infants at high risk for autism. This study characterized the development of aberrant attention in autism by integrating cognitive and developmental neuroscience methods within a multiple-group, prospective longitudinal design. Methods included computerized attention orienting and visual preference paradigms integrated with concurrently measured heart-defined sustained attention. Patterns of behavioral and biomarkers are compared across high risk infant siblings of children with autism (ASIBS), high risk infants with fragile X syndrome (FXS), and low risk controls; thus informing the etiological specificity of early attention indicators of autism. This grant supported an undergraduate student, Ms. Deal, to engage in mentored research on attentional engagement in infants at risk for autism. The goal of this administrative supplement was to advance the development of biomarkers for use in clinical and basic research. This grant enabled an international scholar, Dr. Joe McCleery from the University of Birmingham, to collaborate with Drs. Roberts and Richards on typical and atypical social-emotional, social-communicative and language development in autism and fragile X syndrome. The goal of this study was to conduct a pilot study and refine methodology for a large scale study on the early identification of autism in fragile X syndrome. This grant supported the PI’s program of research including graduate student assistance, collection of pilot data, analysis and publication of extant data focused on the early detection of autism in fragile X syndrome and idiopathic (non-FXS) autism. The objectives of this study were to support the PI’s candidacy for a large-scale grant award to study the emergence of autism in high-risk populations through collaboration with experts in statistical and methodological design and collection of pilot data. This project investigated the relationship of multiple molecular variables to measures of cognition, behavior, and mental health outcomes in children and their carrier mothers.